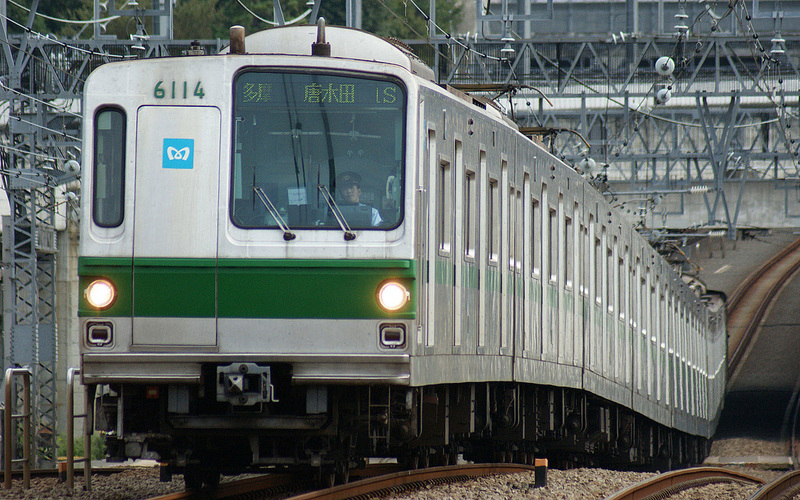 The 6000 Series is a four-door commuter-type electric multiple unit developed by the the Teito Rapid Transit Authority (Currently Tokyo Metro) to operate on the Chiyoda Line. The 6000 Series was developed to become "The Train of the 21st Century" by the TRTA in the late 1960's. It was a technological master piece of its time and was filled with the latest technology. It was the world's first train to use thyristor drive, making it more energy efficient than previous trains. The thyristor drive uses a semi-conductor instead of a mechanical device to switch the electric current on and off at high speeds allowing for higher efficiency and less maintenance. The 6000 Series is also equipped with regenerative braking which allows the train to send electricity that the motor has generated back to the power lines. The resistance created by this process helps the train to brake. The 6000 Series was also adventurous with the body design, adopting a slanted nose and asymmetrical face for the train. The door located on the front of the end car has an emergency escape staircase located inside. The whole body is constructed of aluminum alloy, making it much lighter than previous designs. The general shape and construction was passed on to the 7000 and 8000 Series. The 6000 Series is beginning to be phased out of service by the newer 16000 Series but continues to serve well into the 21st century. A total of 13 formations have been exported to Indonesia where they are operated by PT Kereta Api on the KRL Jabotabek mass transit system.